Why Choose Sports & Orthopaedic Therapy Services? Find out why Sports and Orthopaedic Therapy Services is different, and why you should choose us for the physical therapy needs of your patients. Comparing physical therapy clinics is difficult when you have not seen a therapist before. But not all physical therapists and facilities are alike. 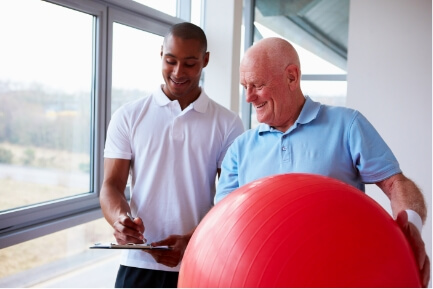 Some physical therapists are generally less experienced and forced to see a high number of patients. This scenario minimizes the potential for the patient to receive comprehensive care utilizing state-of-the-art approaches. Most physical therapists provide “quality care,” but when treatment time is limited to less than one hour it is difficult to provide “comprehensive treatment” of patients with complex or multiple problems. At other clinics, there may only be time to do a cursory exam. We feel the most important component of treatment is the degree of detail produced in the evaluative process. One can only arrive at an effective treatment plan after determining an accurate functional diagnosis. Treatments at SP.OR.T.S. are usually longer than the 45 to 60 minutes common to other facilities. Each therapist is only asked to see 12 to 15 patients per full treatment day giving them adequate time to conduct a thorough exam and comprehensive program. After a thorough evaluation of your problem, they will address biomechanical efficiency, posture, pain, swelling, strength, and endurance as well as effects from joints above and below the injury site. The patient is always provided a written home program taking into account the patient’s goals, thoroughly explaining the working functional diagnosis and rationale for each procedure. New patients are usually scheduled within three working days and often can be accommodated on the day of the call, especially if they are postoperative or in significant pain. We are a clinical internship site for many doctor of physical therapy programs in the region as well as nationally. Robert Grossman, PT, O.C.S. has taught many postgraduate courses locally and around the country on topics from assessment and treatment of somatic dysfunctions of the spine and extremities, altered neurodynamics, to closed chain manipulation-techniques he has developed to address connective tissue restrictions affecting all the joints of the body. We are keen on staying current with the literature and are well versed in all forms of manual therapy. Many facilities have excellent equipment, but less experienced and effective staff physical therapists. Keep in mind, the more educated your therapist is, the more complex the treatment program will be. Advanced techniques and multiple simultaneous procedures take time, and often result in outstanding outcomes, which will include a rapid decrease in symptoms and rapid return to full function. Trust that your patients will be in good hands when you refer them to our practice, well-known within the Washington D.C. medical community for over 32 years. Our experience, innovation, and caring, effective treatment program is key to the doctor/therapist partnership that supports the return to a functional, pain-free lifestyle for our patients.